I don't know about you, but I was bummed when I heard that Verve Stamps is closing. I've loved their sweet stamps and dies for many years. In fact, the first thing I ever won for entering a challenge was a $100 Verve Gift Certificate many years ago. I was SHOCKED and SO excited, and the things I got with that win are still products I pull out and use today. I love their scripture stamps, sentiments, dies, and so much more. So...along with the Verve products I already owned, I picked up a few more at the current 55% off sale of remaining Verve product. I know that I will love and use these Verve products for many years to come. I wish Julee the best of luck in her new endeavors, and thank her for everything she's given to the crafting community over the years. When I received my recent Verve purchase, Julee had tucked in a few extras for me (something she's always done for her customers). She also sent some patterned papers and a doily, so I quickly used them to whip up this card which is stamped with a Plain Jane stamped sentiment from Verve. I added some seam binding and a vintage button. Very simple, but still a lot of fun. I'll be sharing this Verve card in the following challenges, and I thank you SO much for stopping by my blog to say hello. Have a blessed week! 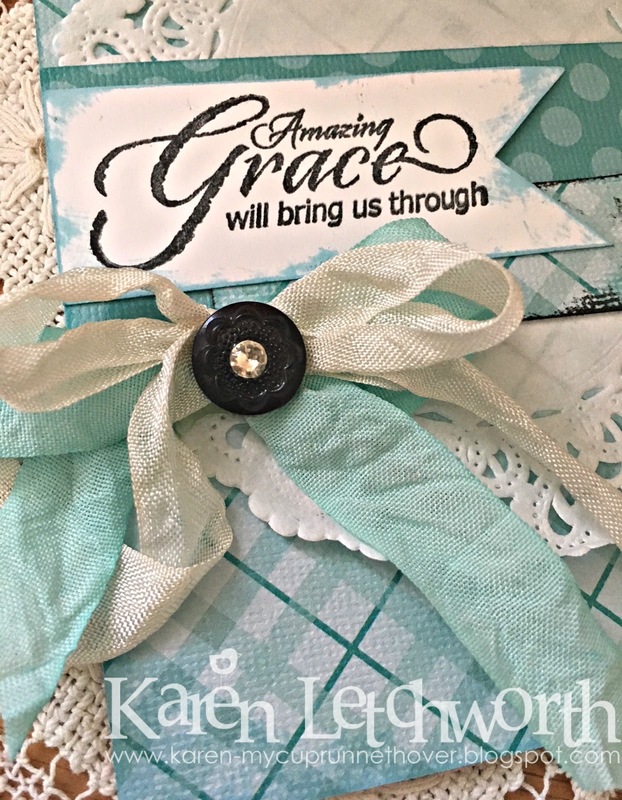 Simon Says Stamp Monday Challenge - All Things Bright and Beautiful- To me, there's absolutely nothing more beautiful than God's AMAZING GRACE, and I also used some bright and beautiful colors on my card. CropStop Challenge #40 - June Link Party - I made my seam binding using Tim Holtz Distress Spray, as well as Tim Holtz Black Soot Distress Ink, and Tombow Adhesive. Wow! that was a fantastic win -- I bet you were super excited! What a great card you've created with these Verve products - I love dyed seam binding! So happy you linked this up to Cropstop - I love seeing your work in the gallery! I know what you mean. I was super sad to hear that Julee was closing her shop. I also understand why she’s doing it. I felt that she was struggling the past few years trying to balance Home life and the business. I found Verve quite a few years ago and have loved each set I have bought. I have also enjoyed the little extras that Julee included with each order. Your card is a sweet and heartfelt tribute to Verve. It may be a simple card design and quickly made Karen, but this is wonderful - and thank you for the sentiment - I needed that today. I loved Mojo Mondays and have been a long time fan of Julee. I am going to miss Verve. There are good things we can do in life and best things. I think Verve was a good thing and quitting to be present with her boys is the best thing. You and I both know how quickly those little boys turn into men. Love the paper and bows on your card. I love the colors of your sweet card, Karen. Sad to hear Verve Stamps is closing but God has something more wonderful for their family! Love the blue color on your gorgeous card. I love Verve stamps too. That is a lovely sentiment on a very pretty card! Thanks for participating with CraftyHazelnut’s Patterned Paper’s June challenge! 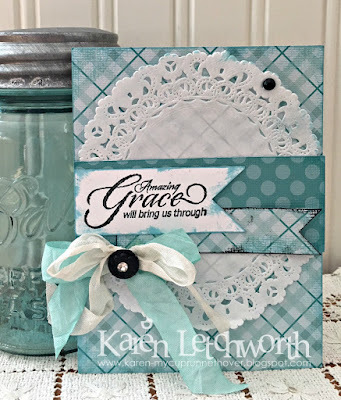 ~~Heidi @ My Little Stamping Blog Come for a visit!